BRYAN EATON/Staff Photo. 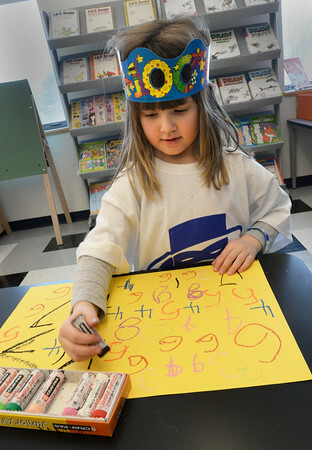 Wearing her 100th Day of school hat, which it was at the Bresnahan School on Thursday, Eva Moyles, 5, writes numbers in Pam Jamison's art class. They were using different colors for each number line from 0-9 in a style of art from artist Jasper Johns whose early works used simple schema as letters and numbers.